I’m behind at posting my old columns, but I was reminded of this article that I wrote a month and a half ago, while briefly sitting beside Omoni Oboli at the dinner after the AMAA award ceremony. Omoni Oboli was nominated for Best Actress for her portrayal of the pregnant Joyce in Lonzo Nzekwe’s film Anchor Baby. She didn’t win the award, but she certainly deserved it. Her admirable acting in The Figurine and Anchor Baby puts her on my favourite Nigerian actress list. To read the article, which was published on 12 February, on the Weekly Trust site, click here. To read the hard copy of the article, click on the photo below, which will take you to a readable version of the article on flickr. To read it on this site, just scroll down past the photo. When anyone asks me what my favourite Nigerian movie is, I tell them it’s The Figurine, which was directed, produced, and acted in by Kunle Afolayan. The film has a tight and continuously gripping storyline that polishes and refines Nollywood genres of spiritual thriller and family drama. But if I’m asked to recommend films, I’ll closely follow my recommendation of The Figurine with the film I went to see last week in Abuja’s Silverbird cinema: Anchor Baby, written, directed, and produced by the debut filmmaker Lonzo Nzekwe, who claims he taught himself filmmaking by reading books and watching “making of” documentaries. In Anchor Baby, which won Best film at the Harlem International Film festival among other awards, Figurine actress Omoni Oboli is compelling in her role as a pregnant Nigerian woman on the run from the American Immigration and Customs Enforcement. Anchor Baby, the title referring to the derogatory American term for babies born as citizens in the U.S. to non-citizens, is a cautionary tale about the dark side of the American dream. The disillusion of emigrants from Nigeria is a theme that has been dealt with in short stories by Chimamanda Ngozi Adichie, EC Osondu, Helon Habila, and others, and is becoming a genre of Nigerian films produced in America as well. The yet to be released film Unwanted Guest directed by Daniel Ademinokan and set in New York, for example, explores the domestic complications an already married Nigerian man faces when he marries an American woman for a green card. The 2008 Hausa film Kano to Saudiyya directed and acted by the late Ziklifu Mohammed deals with similar immigration themes of disillusion with life in Saudi Arabia. The United States doesn’t come across in a very flattering light in Anchor Baby, but it is an America I recognize, even though it was shot entirely in Ontario, Canada. I walked into the cinema five minutes late just as we see the character, Paul Unonga (Sam Sarpong), run across a parking lot and down the grassy incline of an industrial park, chased by American Immigration and Customs Enforcement officials. The film is shot on the film-quality digital RED camera, but the lush colours the RED is capable of capturing are toned down here into dreary grays and browns. It is winter, and the grass is dead. Paul runs past rows of dirty semi-trucks. This is the ugly side of America, not often seen in glamorous Hollywood films. ICE officials eventually catch him at home in the bleak white hallway of his low-income housing flat. Paul’s pregnant wife Joyce (Omoni Oboli) luckily misses the immigration sweep because she has gone out for an early morning walk. 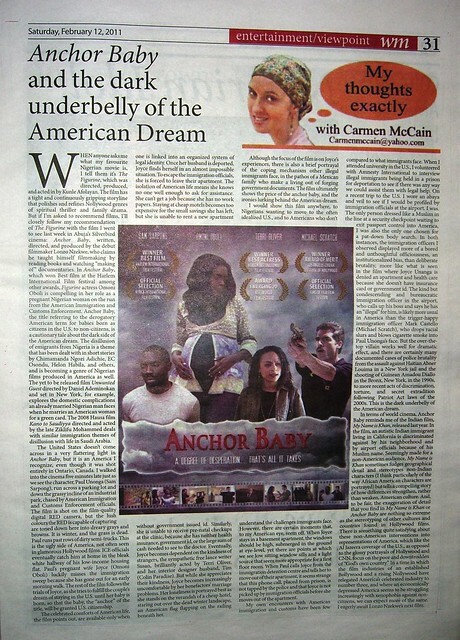 The rest of the film follows the trials of Joyce, as she tries to fulfill the couple’s dream of staying in the U.S. until her baby is born, so that the baby, the “anchor” of the title, will be granted U.S. citizenship. The celebrated comforts of American life, the film points out, are available only when one is linked into an organized system of legal identity. Once her husband is deported, Joyce finds herself in an almost impossible situation. To escape the immigration officials, she is forced to leave their apartment. The isolation of American life means she knows no one well enough to ask for assistance. She can’t get a job because she has no work papers. Staying at cheap motels becomes too expensive for the small savings she has left, but she is unable to rent a new apartment without government issued id. Similarly, she is unable to receive pre-natal checkups at the clinic, because she has neither health insurance, government id, or the large sum of cash needed to see to the doctor. Eventually, Joyce becomes dependent on the kindness of strangers, the sympathetic free lance writer Susan, brilliantly acted by Terri Oliver, and her interior designer husband, Tim (Colin Paradise). But while she appreciates their kindness, Joyce becomes increasingly uncomfortable by her benefactors’ marriage problems. Her loneliness is portrayed best as she stands on the verandah of a cheap hotel, staring out over the dead winter landscape, an American flag flapping on the railing beneath her. Although the focus of the film is on Joyce’s experiences, there is also a brief portrayal of the coping mechanism other illegal immigrants face, in the pathos of a Mexican family who make a living out of forging government documents. The film ultimately shows the price of the anchor baby, and the ironies lurking behind the American dream. I would show this film anywhere, to Nigerians wanting to move to the often idealized U.S., and to Americans who don’t understand the challenges immigrants face. However, there are certain moments that, to my American eye, seem off. When Joyce stays in a basement apartment, the windows should be high, submerged in the ground at eye-level, yet there are points at which we see low sitting window sills and a light source that seem more appropriate for a first floor room. When Paul calls Joyce from the immigration detention centre and tells her to move out of their apartment, it seems strange that this phone call, placed from prison, is not tapped by the police and that Joyce is not picked up by immigration officials before she moves out of the apartment. My own encounters with American immigration and customs have been few compared to what immigrants face. When I attended university in the U.S., I volunteered with Amnesty International to interview illegal immigrants being held in a prison for deportation to see if there was any way we could assist them with legal help. On a recent trip to the U.S. I wore an abaya and veil to see if I would be profiled by immigration officials at the airport. I was. The only person dressed like a Muslim in the line at a security checkpoint waiting to exit passport control into America, I was also the only one chosen for a pat-down body search. In both instances, the immigration officers I observed displayed more of a bored and unthoughtful officiousness, an institutionalized bias, than deliberate brutality, more like what is seen in the film where Joyce Unanga is denied an apartment and health care because she doesn’t have insurance card or government id. The kind but condescending and bureaucratic immigration officer in the airport, who calls up his boss and says he has an “illegal” for him, is likely more usual in America than the trigger-happy immigration officer Mark Castello (Michael Scratch), who drops racial slurs and blows cigarette smoke into Paul Unonga’s face. But the over-the-top villain works well for dramatic effect, and there are certainly many documented cases of police brutality from the assault against Haitian Abner Louima in a New York jail and the shooting of Guinean Amadou Diallo in the Bronx, New York, in the 1990s, to more recent acts of discrimination, torture, and secret extradition following Patriot Act laws of the 2000s. This is the dark underbelly of the American dream. In terms of world cinema, Anchor Baby reminds me of the Indian film, My Name is Khan, released last year. In the film, an autistic Indian immigrant living in California is discriminated against by his neighborhood and by airport officials because of his Muslim name. Seemingly made for a non-American audience, My Name is Khan sometimes fudges geographical detail and stereotypes non-Indian characters (I think particularly of the way African American characters are portrayed) but tells a compelling story of how differences strengthen, rather than weaken, American culture. And, to be fair, the exaggeration of detail that you find in My Name is Khan or Anchor Baby are nothing so extreme as the stereotyping of other cultures and countries found in Hollywood films. There is something quite satisfying about these non-American interventions into representations of America, which like the Al Jazeera coverage of the U.S., as opposed to the glossy portrayals of Hollywood and CNN, focus on the poor and downtrodden of “God’s own country.” In a time in which the film industries of an established Bollywood and a rising Nollywood have relegated America’s celebrated industry to number three, and where an economically depressed America seems to be struggling increasingly with xenophobia against non-citizens, we can expect more of the same. I eagerly await Lonzo Nzekwe’s next film. UPDATE: 25 March 2012. You can rent, buy, or watch a preview of Anchor Baby, in the embedded video here (Anchor Baby).